To easily keep track of your tenants’ schedules and setup status in one central location. A list of all tenants displays. Note: list can be Grouped By No Grouping or Has payer(Yes/No). To export one or more tenants to a . CSV file, select relevant tenants then click Export X tenants. 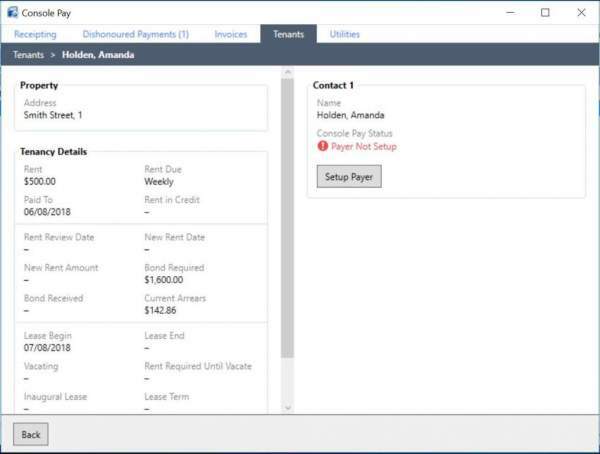 To view more information, select a Tenant, then click View – the Tenants Dashboard displays Property, Rent Details, Contacts, and their Console Pay Status. Note: if there is any missing information required for Console Pay a notification appears under the Console Pay Status. Update as needed or refer to Creating a Console Pay Tenant, if required.